PATRICIA ESPINOSA CANTELLANO, Minister of Foreign Affairs of Mexico, repeated the energetic call of global civil society, made at the sixty-second annual United Nations Department of Public Information/Non-Governmental Organization Conference in Mexico City earlier this month, that Governments assume their responsibilities to achieve a world free of nuclear weapons. She said protecting human rights was a universal ethical imperative and an obligation that no Government could renounce. The health emergency Mexico had faced several months ago with the outbreak of H1N1 influenza showed how the United Nations system could help coordinate States’ actions and prevent inappropriate unilateral measures. The World Health Organization (WHO) had lent its support to the timely, energetic and responsible actions of the Mexican Government. To Mexico, the achievement of the Millennium Development Goals was a commitment undertaken by the State and eradicating poverty was the Government’s priority. She said the international community needed to implement policies that ensured concrete results on the 2002 Monterrey Consensus on development financing, wrapping up the Doha Round of World Trade Organization negotiations, and increasing the contributions of developed countries and multilateral development banks to countries with less growth. Turning to the financial crisis, she said the recent Group of 20 (G-20) Summit in Pittsburgh showed that the magnitude of the crisis demanded coordinated measures by each country to mitigate the crisis’ impact. The United Nations had to understand that the world was undergoing a reconfiguration of the economic global governance and its policies needed to be adjusted accordingly. The austerity imposed by each country had to be reflected in the budgets of the United Nations’ organs. 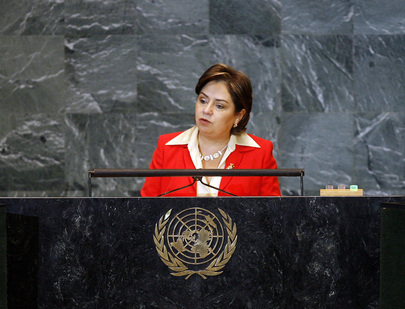 On the issue of global warming, she said Mexico had promoted an innovative financing scheme, the Green Fund, during the preliminary negotiations to the upcoming Copenhagen Climate Change Conference as an economic incentive to move towards the fulfilment of the Kyoto Protocol commitments. The Fund would reward the efforts of States that adopt policies oriented to reducing the levels of greenhouse gases, without jeopardizing their development goals. She said that the Green Fund would fully respond to the principle of common but differentiated responsibilities and was not just another financial mechanism that responded to conventional criteria. The scale of each country’s contribution would depend on several factors, including the level of development, population size and emissions volume. Least developed countries would not have an obligation to contribute. This initiative of President Felipe Calderón had received growing support among Member States. On Security Council reform, she said negotiations needed to move towards a compromise that increased the Council’s representation, provided improved accountability and did not jeopardize its efficiency. It was absurd to argue for static institutions in a changing world. Mexico had presented its candidacy as a non-permanent Council member for the 2009-2010 term. The Council’s legitimacy could be improved by strengthening its work in preventing international crises related to massive human rights violations; preventing conflict by incorporating mandates with its resolutions that link security with assistance for development and humanitarian needs; and make assistance for development a fundamental strategy on conflict prevention and reconstruction.